Uganda - The Order of the Daughters of the King, Inc.
Hellen Wangusa and members of the Brotherhood of St. Andrew wanted to see The Daughters of the King® take root in Uganda, and formed five groups of interested women. In 1992 President Elizabeth Hart visited these groups and others with Mavis Stapleford to introduce The Order and support its development in Uganda. The Revival of the Order in Uganda! For several years there had been no contact with the DOK chapters in Uganda. April Dobbs and her husband had founded an orphanage in Kabale in 2007 and had developed relationships with the Anglican church there. In August 2012, April was able to speak with eight women from Kabale, including Bishop Katwesigye's wife, Laura. 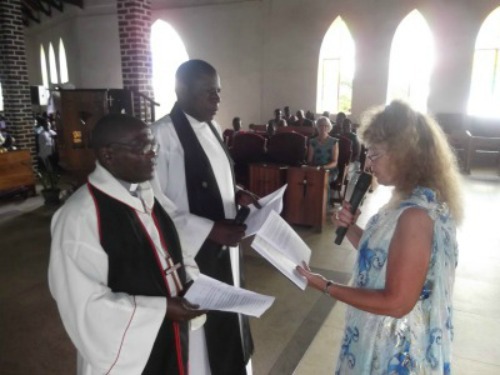 That chapter was instituted in January 2013, and with the help of the rector (now Uganda National Chaplain, The Rev. David Rurihoona) April has instituted new chapters each time she returns to Uganda. Eight women from Kabale met with April Dobbs to learn about the Order in August 2012.
was instituted on January 6, 2013 with 31 members. The Ven. David Rurihoona carry the Ugandan plaque in the closing processional in Utah. 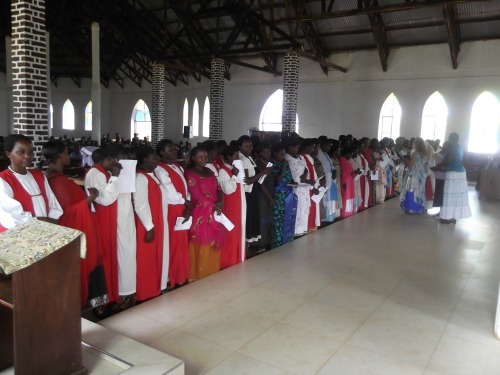 Kamuganguzi, Uganda led the 84 new members of the Order in praying for Triennial 2015. Daughters Of the King® National Chaplain. Seven New Chapters in Uganda in 2015!
" 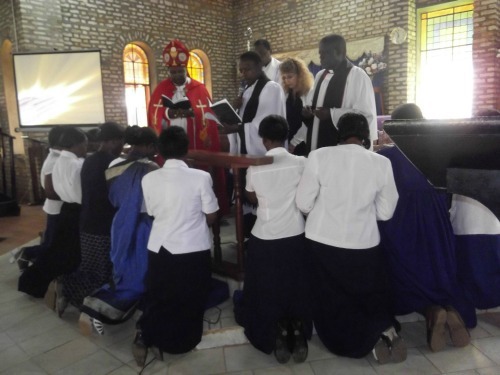 We installed 7 new Chapters in 14 days from August 16 to August 28 in Kigezi Diocese, Uganda. Rev. David Rurihoona, The Country Chaplain for Uganda and I traveled on some very scary roads to little churches deep in the mountains where you would never think to find dozens of very enthusiastic women ready to become Daughters of the King®. But, there they were! They had completed the study with the help of Presidents of already established chapters, and their love of Jesus was very evident. There were 355 women who became Daughters during that 2 week period." In these pictures you will see mostly woven crosses that were made by Daughters in the Diocese of South Carolina! Country Coordinator April Dobbs will take them all their "official" crosses next summer (2016). Uganda now has 12 chapters, Nine (9) in the Diocese of Kigezi, two (2)in the Diocese of Kinkizi and one (1) in the Diocese of Masaka. Barbara Thomas, at the institution of Resurrection Chapter in Kanungu on August 24, 2014. August 17, 2014 by Country Coordinator, April Dobbs. 48 new Daughters were installed! and the newly appointed National Chaplain, The Ven. David Rurihoona. The new members of Amazing Grace Chapter at St. Peter's Cathedral, Kanungu, Uganda.